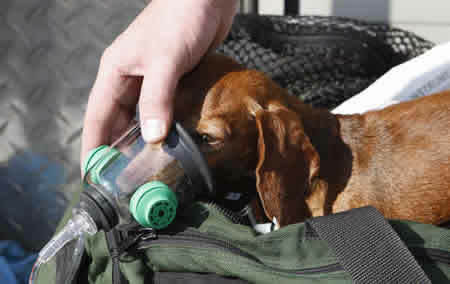 Rooney, a miniature dachshund, was saved by a custom-made pet oxygen mask when his owner’s house was filled with carbon monoxide. A Lexington firefighter was able to give Rooney oxygen with the pet mask while other firefighters were treating Rooney’s owners. Rooney is being treated at an animal rehabilitation center. At first, Rooney was unconscious when he arrived to the center, but since the firefighters were able to use the pet oxygen mask on Rooney and got him to the center quickly, he is expected to recover. Last month, the Lexington Kennel Club donated 24 sets of animal oxygen masks to the fire department. In May, Delaware was the first state to equip all of the fire stations with pet oxygen masks. Thank you firefighters for saving our pets. This entry was posted on Friday, June 8th, 2007 at 3:52 am	and is filed under Cats, Other Pets, Dogs, National Dog, Cat & Pet Info, Products & Services for Cats & Dogs, News for Cats, Dogs & Owners. You can follow any responses to this entry through the RSS 2.0 feed. Both comments and pings are currently closed. Good for Delaware. The two animal shelters in my area have donated these masks to 7 local volunteer fire departments, but it’d be nice to have it statewide. Two thumbs up for pet oxygen masks!! We love our pets as much as oursleves. So glad that Rooney is ok thanks to one of these masks and a thoughtful, fast acting firefighter.